Andrew Nethsingha and the Choir of St John's College, Cambridge have put together a programme of 20th century music to sacred texts on his disc on the St John's imprint on Signum, with Francis Poulenc's Mass in G, Zoltan Kodaly's Missa Brevis and Leos Janacek's Otcenas. None of the works was written for a choir of boys and men, and for all the frequency that the Poulenc and the Kodaly crop up in collegiate choirs, this change in focus and timbres produces some striking new reflections on the pieces. 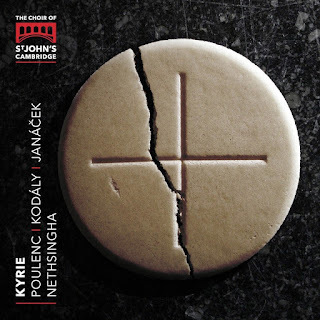 Having last heard the Poulenc on The Sixteen's recent recording [see my review], that from Andrew Nethsingha and his choir highlights some striking differences. There is a transparency, delicacy and clarity to the textures on this disc, arising from the sound of the trebles on the top line. Yet it is not undernourished, there is a wiry strength too. The solo treble lines might seem to be just a thread, but rhythms are punchy and there is a wonderful edge to the more jagged harmonies. There is lightness and control, but steel too in the Sanctus & Benedictus, and the beautiful thread of solo treble at the opening of the Agnus Dei leads to a magical ending. The Poulenc was written in 1937, reflecting not so much the political situation as the personal. Kodaly's Missa Brevis was written just a few years later and premiered in Budapest as Soviet forces fought to 'liberate' the city from the Germans, the reflection of the political situation could not be stronger and Kodaly's subtitle is 'Mass in the time of War'. After a powerful organ Introitus, comes the grave beauty of Kyrie with ethereal high treble lines, which contrast with the earthier lower voices. There is a vibrant folk-influence vigour to the Gloria, with contrasting expressive 'qui tollis'. The immediacy of the Credo also seems folk-inspired, with some lovely rich chordal textures in the 'crucifixus'. The gentleness with which the Sanctus starts, with considered climaxes, leads to some mystical moments. The lines of the Agnus Dei are angular, with a powerful climax leading to the almost mystical 'dona nobis pacem'. Organ Ite, Missa est has thematic links to the preceding movements and brings things to a vibrant close. Janacek's Otcenas, a setting of the Lord's prayer, was written for fundraising for the Women's Shelter in Brno and it premiered at the Brno Theatre in 1901, three years before the premiere of Jenufa, though the work is heard in the revised version from 1906 for choir, organ and harp. Not a sacred work, despite the text, it was originally intended to accompany tableaux vivants inspired by religious pictures by Jozef Mecina-Krzesz. The result is a five movement work, each setting a section of the prayer in Old Church Slavonic, the movements flow together to form a striking whole. It is perhaps Janacek's writing for the combination of organ and harp which creates the most magic. Janacek's vocal writing has his distinctive outlines, but is somewhat more lyrical than his later Glagolitic Mass. Fine organ support is provided by Joseph Wicks (in the Kodaly) and Glen Dempsey (in the Janacek) with Anne Denholm adding a lovely harp timbre to the Janacek.